Just In! 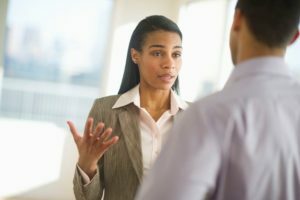 Give Voice to Disagreement - Take Charge Inc.
New findings reveal that people attribute more human qualities to those who orally express their disagreement rather than noting it in writing. As a leader, you are expected to take a stand even when others are willing to forgo conflict and “go along to get along.” It is often quicker and easier to stay behind the computer or tablet and e-mail (or text) someone with whom you disagree than it is to deliver your message face-to-face. However, when you do, you are missing a significant advantage according to researchers Juliana Schroeder, Michael Kardas, ad Nicholas Epley in recent research reported in Psychological Science. Orally voicing an opinion rather than writing one, highlights specific aspects of speech, such as intonation and pauses, that humanize the people who are speaking – making them seem more intellectual and emotionally warm than those whose opinions are written. Your voice reveals a human mind capable of thinking and feeling. It “invites” the other vs. dumping your view on her or him. State your view without diminishing or negating the other’s opinion. Example: In the meeting this morning you said you wanted us to stop using the services of vendor A. I believe that I’ve done a good job of vetting our vendors and that I deserve to have a chance to review what Vendor A has contributed to our team’s success with you in a mutually respectful way. Keep the discussion focused on the best organizational outcome. Example: I understand that after we discuss this thoroughly, you may still want to proceed as you originally stated. However, I believe I owe you the advantage of hearing what Vendor A has contributed to our team’s success before you decide to cancel their contract. When others shut you down, it may be that they’re incapable of dealing with dissent and mistake it for lack of trust or disrespect. By resisting an immediate response, meeting face-to-face or phone-to-phone, clarifying your intent before diving into the content of your concerns, and asking for permission to disagree — you’ll be able to disagree far more effectively.